In the 3rd test of five-match series between England and India, Virat Kohli and men took a lead of 292 runs at the stumps on Day 2. Team India scored 124 runs with the loss of 2 wickets after England collapsed for 161 runs. 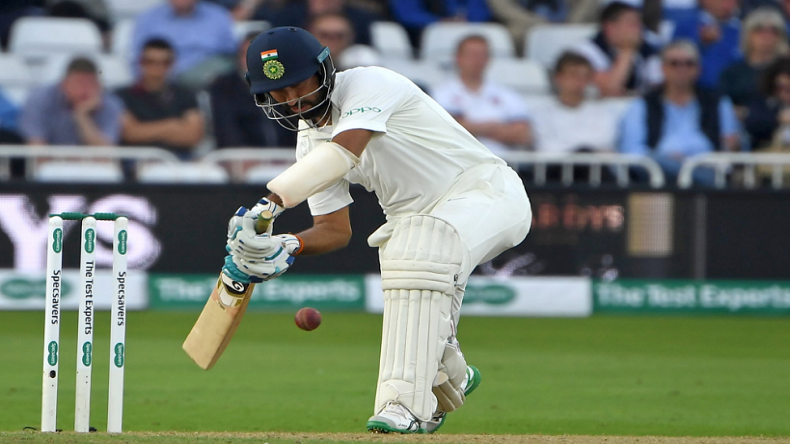 At the stumps on Day 2 of the 3rd test match between England and India at Trent Bridge stadium in Nottingham, visitors took a lead of 292 runs after England collapsed for 161 runs in their first innings. In the last session of the day’s play, team India scored 124 runs in 31 overs with the loss of 2 wickets. Opener Shikhar Dhawan scored 44 runs and KL Rahul hit 36 runs in India’s second innings. While Cheteshwar Pujara (33) and skipper Virat Kohli (8) will continue batting on the day 3. For England, pacer Ben Stokes and spinner Adil Rashid picked a wicket each. Earlier the day, English batting line-up collapsed like a house of cards in the second session of the Day 2 of the Nottingham test. Indian all-rounder Hardik Pandya picked up a 5-wicket haul for just 20runs. Performing equally good pacer Ishant Sharma dismissed 2 English batsmen, while Jasprit Bumrah and Mohammed Shami took 1 wicket each. Alastair Cook (29), Keaton Jennings (20), Joe Root (16), Ollie Pope (10), Jonny Bairstow (15), Ben Stokes (10), Jos Butler (39), Chris Woakes (8), Adil Rashid (0) and James Anderson (1*). The god of cricket Sachin Tendulkar, in a Tweet, lauded Hardik Pandya for dismissing five English batsmen and debutant Rishabh Pant for his fine wicketkeeping. After the fabulous performance from team India, former cricketer VVS Laxman praised Virat Kohli and men and congratulated all-rounder for his five-wicket haul. At the lunch, on the Day 3, England scored 46 runs without losing any wicket in reply to India’s 329 runs. English opener Alastair Cook scored 21 runs off 30 balls (3X4) and Keaton Jennings hit 20 runs off 25 balls (3X4) by the end of the first session on Day 2 of the Nottingham Test. Earlier the day, team India started the game on a bad note and lost 4 quick wickets. India lost debutant Rishabh Pant (24), all-rounder R Ashwin (14) and tailender Mohammed Shami (3) and Jasprit Bumrah (0) early in the first session of the day 2 and managed to score 329-runs in the first innings. English pacer Stuart Broad, James Anderson and Chris Woakes picked up 3 wickets each, while spinner Adil Rashid bagged the important wicket of India skipper Virat Kohli, who missed his century by 3 runs. On the first day of the match, Virat Kohli and Ajinkya Rahane’s 159 run partnership rescued team India and helped the side to set a reputable score. Captain Kohli scored 97 runs off 152 balls with 11 boundaries. Playing equally well, middle-order batsman Ajinkya Rahane hit 81 runs off 131 balls with the help of 12 rolling boundaries. Today, India’s first Innings ended on 329/10 in 94.5 overs. Following delays this morning due to rain, play is now back underway at Trent Bridge in the third Test between England and India! Can debutant Rishabh Pant kick on after a good start with the bat? India start day two on 307/6.